Black, white: contrasting tones which make the head spin - the Hypnose watch seems to whirl Cartier timekeeping into a never-ending spiral. A jewellery watch of hypnotic fascination, its aesthetic appeal lies in the form and power of illusion inspired in its lines. In one stylish yet disciplined stroke, Cartier has created a major new watchmaking classic in the Hypnose timepiece. The elegance of its oval form, edged with diamonds, is feminine, subtle and definitively Cartier with an essential brilliance. 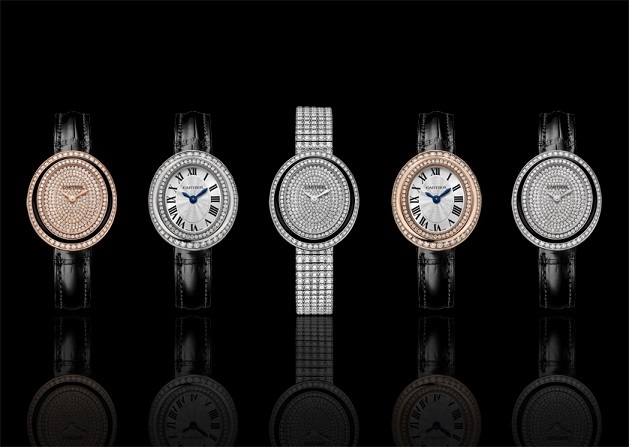 Graphic ellipses of pure, jewel-like white are accentuated by the luminosity of pavé-set diamonds to create a watch that falls halfway between sophisticated evening attire and exquisite day wear. Movement, perspective, optical illusions. All these and more are encapsulated by the virtuosity of savoir-faire in the black lacquer filling the hollows together with the diamonds illuminating the hours from one oval form to the next.